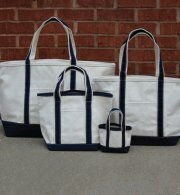 Our most popular and biggest beach bag, the Large Boat Tote is your go to seaside tote bag. Quality canvas handles with a 9 inch handle drop. 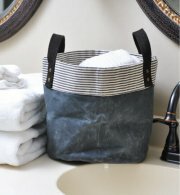 18 oz canvas with sturdier seams that allows tote to stand on its own. One outer pocket with a open top great for easy access to smaller items. Our most popular and biggest beach bag, the Large Boat Tote is your go to seaside tote bag. Ideal for toting a lot of stuff for you or your whole family, this bag's roomy interior is sure to make it a fast favorite among trips to the beach, park or really anywhere given It's classic design. Featuring navy contrasting trim and a top zip closure, this bag also includes a nice outer pocket for easy access to smaller items such as a phone. 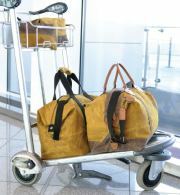 It's not ?ust?a beach bag - It's a everything bag! 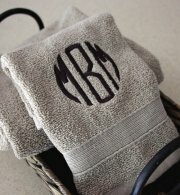 Adding a monogram to our Large Boat Tote makes for a great large impromptu gift bag or event take away as well.